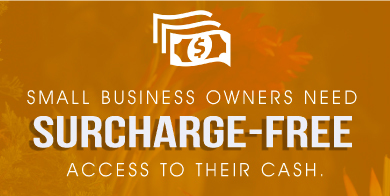 Members can use over 100,000 ATMs surcharge free! Q. How does Mill City provide so many surcharge free ATMs? Mill City partners with three different ATM Networks to provide access to over 100,000 ATMs to our members. Q. 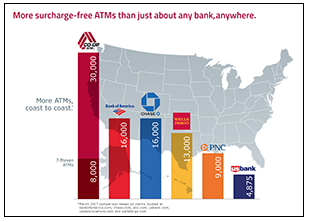 Which ATM Networks can members use, surcharge free? Mill City partners with CO-OP, MoneyPass and Allpoint ATM Networks. All three Networks offer surcharge free access. Q. How can I find an ATM near me? It’s easy! We offer a mobile-friendly ATMs + Branches locator on millcity.cccu.com and in our Mobile Money app. Q. What do I do if the ATM on your locator says it will charge me a fee? We do all we can to keep our ATMs + Branches locator up-to-date but occasionally the ATM owner has not reported the change in their surcharge free status to one of our networks in a timely fashion. We recommend you refrain from using the ATM that charges and find a better, surcharge free ATM to use. We apologize in advance for the inconvenience if this should happen to you. Q. How does your ATM coverage compare to that of a large bank? We’re proud to offer ATM coverage that rivals and exceeds the ATM networks of much larger banks and credit unions. Check out this infographic to see how we compare – just considering ONE of our networks. Infographic provided by the CO-OP ATM Network.